I read this article and found it very interesting, thought it might be something for you. The article is called Dental Bridges and is located at https://www.dencaresmilecenter.com/general-dentistry/dental-bridges/. A missing tooth can effect even the most beautiful smile, but Lake County IL general dentist, Dr. Gustav Kozina, can restore your beautiful smile with a dental bridge. Along with dental implants or partial dentures, dental bridges are another common way to replace missing teeth. Aside from the cosmetic issues that can arise from having gaps in your smile, missing teeth can also cause a host of other health problems. The other teeth in your mouth could shift, your bite may change and you have a greater chance of contracting painful TMJ. The replacement of these missing teeth is necessary in order to maintain the proper mouth functions. Traditional Dental Bridges involve creating a crown for the tooth or implant on either side of the missing tooth, with an artificial tooth, or pontic, in between. Traditional bridges are the most common type of bridge and are made of either porcelain fused to metal or ceramics. Cantilever Dental Bridges are used when there are adjacent teeth on only one side of the missing tooth or teeth. They usually require connecting at least two teeth to provide enough support for the pontic. 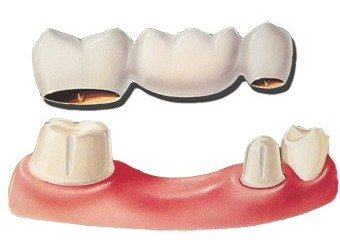 Resin-Bonded Dental Bridges (also called Maryland bridges) are made of porcelain teeth supported by a metal framework. Metal wings on each side of the bridge are bonded to your existing teeth. The procedure begins with preparation of the natural teeth, or abutments. The dentist will shape the abutment teeth so that the ends of the bridge will fit comfortably on each one. The next step is to take an impression of the area. This impression will be sent to the lab where your new restoration will be made. While this new tooth is created, you will be provided with a temporary restoration. 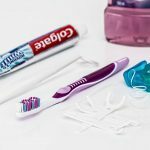 The temporary restorations will resemble your natural teeth so that you can continue with your daily routine without worrying about a missing tooth. During your second office visit, the dentist will proceed with the placement of your final restoration. This bridge will be fitted comfortably into the mouth. Every effort will be made to ensure that the new bridge is comfortable and feels exactly like your natural teeth. 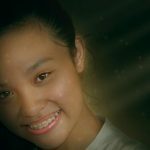 The final step in the process is to cement the bridge into your mouth, leaving you with a beautifully restored smile.